Preschool visual motor worksheets seem to be a standard activity in most preschools these days. 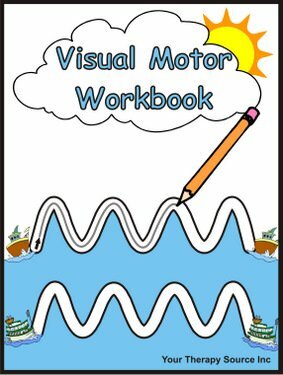 This page reviews several excellent, inexpensive, downloadable visual motor e-books that you can reprint over and over for all your children. 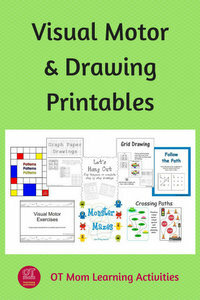 Teachers often use printables like these to help preschoolers master some of the visual motor components of handwriting. However, worksheets are NOT the best way to help your preschooler develop visual motor skills! Before working on paper and pencil tasks, your preschooler needs lots of practice in getting eyes and hands to work well together. My advice to all moms with preschoolers is to work on visual motor integration skills BEFORE trying worksheets. But if you are sure you want some preschool visual motor worksheets, then go ahead and check out the ones I review below. Use the quick links to jump to the one you want to see. There are so many awesome choices, so be sure to check out my comparison so you can choose exactly what your child needs! Is My Child Ready For Worksheets? All children develop at their own pace, so I can't prescribe an age at which your child should be ready to tackle worksheets. However, the younger the child, the less time should be spent doing paper-and-pencil tasks. These preschool visual motor worksheets are meant to be used AFTER your child's visual-motor integration skills are ready to tackle simple pencil-and-paper activities. A single worksheet page at a time should be sufficient for a preschooler, and only for a short period between other active play activities. If your child rushes through, ask him/her to go back and add some more color (go over each path/line in a different color each time to make rainbow lines). If your child struggles to stay on the line or in the path, rather leave worksheets for a while and go and do some eye-hand coordination exercises, or take part in some visual motor activities to develop visual-motor integration skills. If your child struggles to hold a pencil, you can still use these worksheets, but have your child trace the path with a finger instead. You can also laminate the worksheets or put them inside a plastic sleeve to use them over and over with a fat wipe-off marker. Colorful and interesting visual motor worksheets for preschoolers! A lot of work has gone into making these visual motor printables attractive for preschoolers. Even if you have to print these in black/white instead of color, the pictures and shading are still interesting. The worksheets are gently graded, and give preschoolers lots of practice in weak areas (eg diagonal lines, corners, curved lines). Your child can use a crayon or a finger to trace the lines; or you can laminate the sheets and use wipe-clean markers. For older kids, I printed 2 pages on each sheet of paper, as older children are able to work over slightly smaller areas. Be sure to work "big" on the blackboard and in a sand tray before moving onto worksheets, though. Included at a 30% discount in the Preschool Premium Bundle Deal. Printing: Best in color, but still acceptable in Black and White. You may reprint this resource as often as you need to. Included in the Preschool Visual Motor Bundle at a 30% discount! The cute penguins make a great motivation for staying on the paths in this set of worksheets! These preschool visual motor worksheets increase in difficulty as the paths get narrower AND/OR by adding more curves, corners and loops. The challenges start with simple, short, straight or curvy lines, which get progressively longer. The longer ones then get more challenging with more loops and curves, and also have a wide path or narrow path for the pencil to follow. I particularly like the steady progression of the challenge (no big jumps from easy to difficult). After purchasing, you can choose between full page downloads (a single penguin challenge on a full page), OR, my favorite, you can get 4 penguin challenges on a single page - same challenge, just smaller, which is also more challenging as the lines are narrower!. Printing: Black and White or Colour (both versions are given to you on purchase). You may reprint this resource as often as you need to. Visual motor, tracing and copying skills. 24 graded worksheets that will take a preschooler from tracing simple straight and wavy lines, all the way to practicing the handwriting patterns needed for kindergarten. Some sheets give tracing practice, others give copying practice, and there are fun activity suggestions to make worksheet completion more interesting. A caveat, though - I always prefer to teach children to master lines and patterns on other mediums, such as on a board, in the sand, on a vertical surface etc, before moving to worksheets. I would only use preschool visual motor worksheets like these to give kids extra practice in refining the skills and help the child learn to work with a pencil on paper, and not for actually teaching the skill. If your child struggles to master the tracing and copying of patterns and lines, please help them work on visual motor integration with these fun VMI activities. Printing: Although there are small color pictures to add interest on many of the pages, the pages can easily be printed in Black and White. You may reprint this resource as often as you need to. My children love these LONG visual motor activities. Print them out, stick the paths together and laminate them to make them last. There are 25 long mazes and patterns of various difficulty, and once the pattern is assembled (very easy to do) it is 28 inches long! This is one of my favourite preschool visual motor worksheets as it is helps kids work on visual motor skills over a large area! Kids are encouraged to work from left to right, to cross their midline, and to develop visual-motor integration skills. When I use these, I have the child go over the path a number of times with different colors of wipe-clean markers. Printing: Black and White. (I added color to the paths with a marker before laminating) You may reprint this resource as often as you need to. Visual motor shape practice for preschoolers. Each "booklet" progresses from coloring the shape, to drawing the shape inside a path, to tracing the shape, completing the shape and then finally drawing the shape unassisted. As with all visual motor activities, I recommend working "off-paper" to master shapes before moving to pencil and paper work. Shapes include circles, squares, rectangles, triangles and diamonds, and the final booklet contains all 5 shapes. You make the booklet by printing out the 5 pages for each booklet, cutting them in half and then stapling them together to end up with a 10 page little booklet. So if you are looking for a cleverly folded true mini-book format, this is NOT it. However, if you are looking for a graded series of little worksheets for your preschooler to practice on, then these could be useful. Comparing the Best Preschool Visual Motor Worksheets! The Penguin Pencil Challenges are all paths from one penguin to another. The paths start from easy, short straight lines in all directions then progressively become harder, adding curves, corners and patterns. Increasing the Challenge: The worksheets increase in difficulty by adding more curves and corners, and by having narrower paths. The Visual Motor Workbook has paths and dotted lines to trace. It gives the younger child more practice at the straight lines first, with lots of opportunity to work on horizontal and vertical lines before moving onto diagonals and corners. The worksheets are visually interesting, with all kinds of themes. Simple shapes are included towards the end of the workbook. Increasing the Challenge: The worksheets progress from paths that the child needs to stay on, to dotted lines that the child must trace. Some worksheets also give your child the opportunity to draw the line/shape without a visual cue (eg drawing a triangle sail on a boat). Lines, Lines and More Lines is all about tracing on the lines - no paths for drawing in. The lines are light grey, and progress from vertical and horizontal lines to slants, diagonals, curves and corners. There are also various patterns for your child to trace, with rounded or zigzag lines, or even loops. Increasing the Challenge: Once your child has mastered tracing patterns, the harder worksheets require your child to copy various patterns (without tracing), and the last couple pages give a fun dice game where your child needs to draw various small lines inside pictures according to the roll of the dice. Visual Motor Exercises is a completely different concept to the other preschool visual motor worksheets, and would be my first choice for a preschooler as it works over a larger surface area (28 inches long once you cut the sections and stick them together) and encourages crossing of the midline while drawing the path as well as emphasizing working from left to right. Increasing the Challenge: The workbook is not actually set out in order of difficulty, but some of the exercises are definitely more challenging than others. Some are paths, some are dotted lines, some ask your child to draw a path from one obect to another (eg from star to star), other exercises require your child to draw a path between the obstacles (eg between clouds). There is a lot of variety! I personally would pick the paths first, and then the dotted lines, and then progress to the exercises where your child has to draw the lines without tracing. 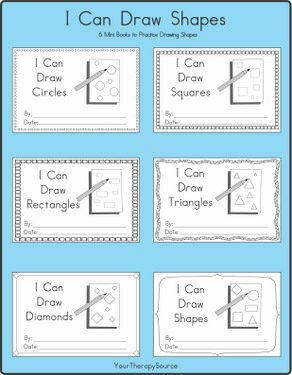 I Can Draw Shapes helps your child master the drawing of shapes with as a pencil-and-paper task. Increasing the Challenge: Your child will progress from paths and dotted lines to "complete the shape" options and free hand shape drawing in each booklet. Probably best for older preschoolers and kindergartners. Preschool Visual Motor Worksheets Bundle Deal! 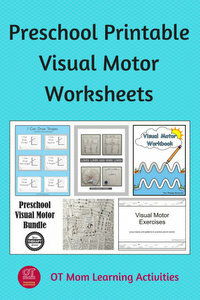 Get a 30% discount on individual titles when you purchase this special preschool visual motor worksheets deal! 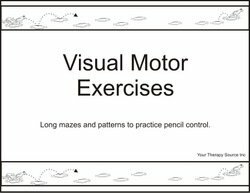 For older kids, check out these Visual Motor and Drawing Worksheets. Or use these resources to work on your preschooler's other Visual Perceptual Skills. Thank you for visiting my site! I hope this page helped you in your search for good quality preschool visual motor worksheets! I really recommend understanding what visual motor integration is all about, as this is such an important preskill for handwriting!